The management of the tactics is definitely one of the most interesting aspects of Football Manager 2016. The purpose of this guide is to present the available tactics in FM16 also giving some useful advice to the less experienced players, of course, every coach has their own approach to the game but there are some aspects that manager should not overlook. After selecting the "tactics" in the bar at the left side of the screen we are immediately on a screen where we can choose holders and reserves. We have a lot of freedom in determining the position of our men in the field and virtual coaches can indulge themselves in the creation of original patterns and formations. Of course we can also refer to the provisions of the most classic game by selecting "training set". Of course, our advice is to take account of the opponent that you face in the next game if you play against Inter and Foggia (with all due respect) does not make sense to set a mentality based Containment. You have to be good at knowing when to bet on the counter-attack, when to attack, when to check ... It all depends on the analysis of your strengths and weaknesses of the opponent. The mentality can also be changed during the match, but start on the right foot is definitely an advantage not to be underestimated. By choosing a more structured system of game players participate less in phases other than those of their expertise, while focusing on a provision smooth players contribute to all stages. The flexible arrangement, however, is a good compromise that allows the team to find a balance. Again there is no provision better and worse, it depends on the situation you are in and the type of football you have in mind. By choosing to focus on "Very smooth," for example, attackers are moving and help a lot more, but in doing so end up being tired and not very bright in front of goal. Each option has advantages and disadvantages that you, as a coach, have to be good at assessing. This screen is also present the "Instructions", selecting it will open a large panel where you can set different parameters. 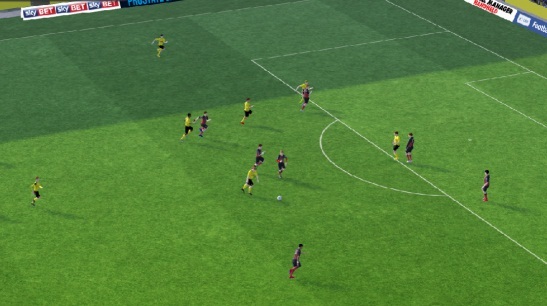 Here, in fact, we have the ability to manage the pace of the game (by ordering, in case, waste time), we can adjust the width of the game, set the height of the defensive line to manage the offside trap, adjust the pressure with ordering revenue more or less aggressive, choose the band or industry field in which to focus our game, manage the steps (before, plus touches ...), giving instructions to the attackers and adjust the cross. This panel is fully usable during the game and is essential to learn to know it inside out, so you should take a bit 'of time to study it properly before taking to the field. From here, also, we can also select mentality and field layout. We now turn to the individual tactics: clicking on "Player" in the tactics screen we can select each individual member of the training and give specific instructions on marking, homework, passing, shooting and more. Here we can see all the statistics of the players and assign individual roles (tip support rather than striker for example) to our men. Turning to the section "Set Pieces" have the opportunity to choose who will bring punishment, corner kicks and penalties, next to individual players find related statistics and invite you to take this into account. Selecting the individual entries for the penalty and the corners also enter into a useful screen that will allow you to achieve your custom offensive and defensive schemes. You can move players at your leisure in the area and assign various tasks (stay back if needed, cut to the near post, attacking the area, disturbing the goalkeeper, you are at the far post ...). This tool is easy and intuitive to use, a diagram decent time-consuming but also provides great satisfaction. You can create different routines to use in the game, to move players on the field simply drag them with the mouse and assign them a task just use the small screen in the bottom right corner. Now we come to the "Instructions on the opponent" from this screen, always in the panel tactics, you can assign tasks to your players giving specific orders on individual opposing players. You can decide the scoring, determine the pressure on a man, the violence of the conflict and select the foot of which bring man. In conclusion we point out the "Analysis": here you can read all the data on your team, get information about individual games, spy on opponents and understand how effective a tactic. The perfect tactic does not exist, coaches must be able to harness all the tools at their disposal to improve more and more and take account of the opponent. Football Manager 2016 offers a great freedom to the player, allowing you to create patterns and adjust a great amount of parameters: we advise you to experiment without fear all your ideas, even those that appear most absurd, you might get more unexpected results.